Not so long ago I received a call from a lady enquiring about a portrait commission. Her overriding concern seemed to be the size of the finished painting. I explained that, as I stretch my own canvases, I can work to any size, so the only consideration really needed was where the painting was likely to hang. “Do you know where the painting will hang?” I asked. “In a palace.” she replied. That word again ‘palace’. Not unnaturally, I had a couple of follow-up questions. The first of which was “Do you mind me asking where you are calling from?” . . . “The United Arab Emirates.” she replied. As this required further consultation, I arranged to speak with the client, her husband, who was flying in from Abu Dhabi. We met at a hotel in Park Lane, although, I still didn’t know who it was I was being commissioned to paint. Shortly into our conversation over coffee, I was told it was to be Sheikh Mansour bin Zayed Al Nahyan, a leading member of the Abu Dhabi ruling family and better known to English football fans as the owner of Manchester City. 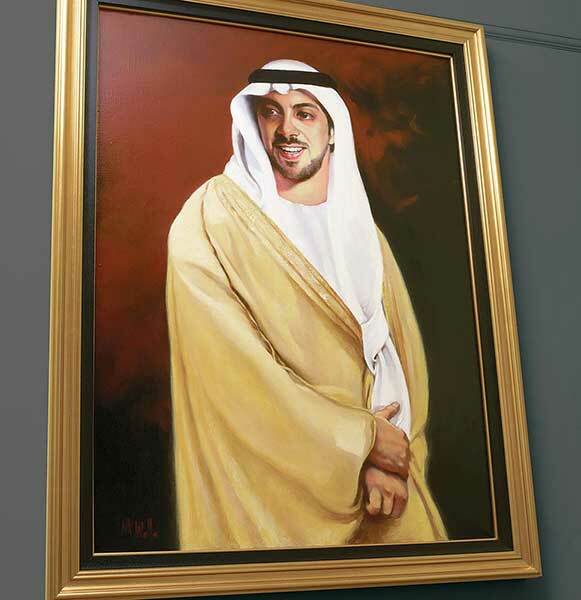 I decided to paint the portrait life size at three quarter length and I had it framed and delivered to Abu Dhabi four months after the London meeting. I hope it was big enough.